Director: Robby Benson, John Bowab, Iris Dugow a.o. Story: Comedy, which actually became a "lesbian series" after the coming out episode (The puppy episode) in the 4th series, which was aired in the United States on april 30, 1997. After Ellen DeGeneres came out publicly both private and in the series, "Ellen-coming out parties" were organised all over the USA. 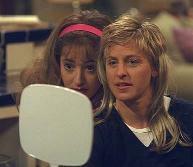 Ellen was the first homosexual lead character on a TV-show. The series, which started as "These friends of mine", shows Ellen as a former bookseller in Los Angeles. In 2001 Ellen started a new comedy series with 'The Ellen Show'. Verhaal: Komedie, die eigenlijk pas een "lesbische serie" werd na de coming out aflevering in de 4de serie(The puppy episode), die in de Unites States op 30 april 1997 op TV kwam. Nadat Ellen DeGeneres zowel prive als in de series aan het publiek bekend maakte dat ze homoseksueel is, werden er door heel Amerika "Ellen coming out feesten" georganiseerd. Ellen was de eerste homoseksuele hoofdpersoon in een TV-show. De serie, die startte als "These friends of mine", toont de gebeurtenissen rond Ellen Morgan, een voormalige boekhandelaar in Los Angeles. 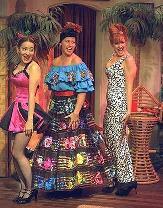 In 2001 startte Ellen met een nieuwe komedie 'The Ellen Show'.